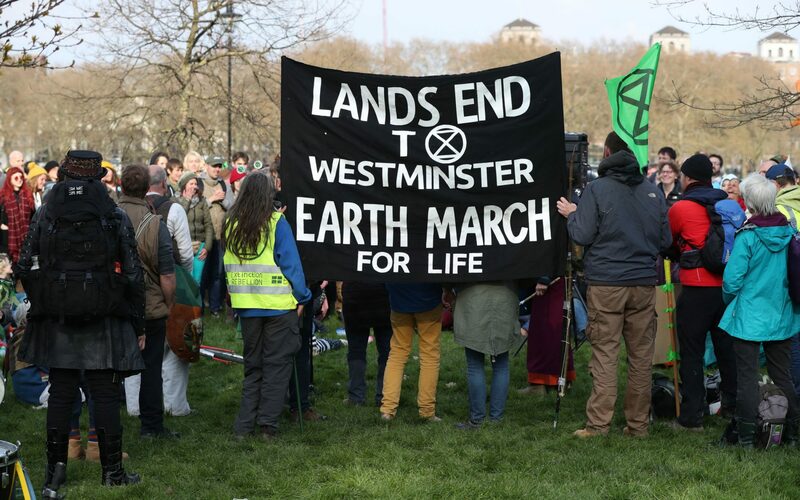 Activists hold banners and wave flags as they continue to block on Waterloo Bridge on the second day of an environmental protest by the Extinction Rebellion group, in London on 16 April 2019. The remaining 117 were on Waterloo Bridge on Monday night and in the early hours of Tuesday, with the majority made for Public Order Act offences and obstructing a highway. A Transport for London spokesman said: "There are demonstrations taking place across London which are causing disruption to some bus services and on the road network". "Suddenly, what Extinction Rebellion has done is actually say: 'we are doing this.' And the state is so weak through austerity that they can't stop us". "We must act now". Speaking at a meditation on the eve of the protests, Dr Williams said humans had declared war on nature. Instead we demand a Citizens' Assembly to oversee the changes, as we rise from the wreckage, creating a democracy fit for objective. We need to change the way we do everything, the way we use fossil fuels.